This has been a year of heritage for our family. Our daughter Hannah is African American and my partner and I are of European heritage, specifically German in my case. Brad, my partner is German and Scottish, but is not a German speaker. I am close to my heritage because my parents were German immigrants to the United States and I grew up speaking German with them. When I adopted Hannah, I asked an African American colleague who had relatives in Germany whether I should teach Hannah German. Absolutely, she said, because Hannah should feel like she is part of the family and because of all the advantages of being bilingual. Well, I didn’t succeed in teaching Hannah much German at home, but she did learn a little bit of German from my parents before they passed away. With my parents gone, I felt a longing to connect with my relatives in Germany. So Brad, Hannah and I traveled to Germany and she thoroughly enjoyed it, but she didn’t learn much German because my almost my relatives spoke English. Then I received a Fulbright Fellowship to go to Ghana. I had considered applying for a Fulbright in Germany, but decided it was more important that Hannah “find her roots” in Africa. Little did I know that she would connect with her German heritage in Ghana. As we looked for a school where she could attend kindergarten, doors kept closing. The schools we liked were full or they turned out not to be a good fit. We received a warm welcome, however, from the German Swiss International School, both via email and in person. Amazingly, when Hannah visited the office of the headmistress and she asked her to help serve us some coffee, she walked over to the espresso machine and filled a cup, just as she instructed. Brad said, “I think her receptive language is pretty strong.” Brad knows a lot about language but the one he studied in college was ancient Greek, which no one speaks any more! So, we enrolled at the German Swiss International School and her German has been improving every since. Not only that, but her friends at the school are showing her in various ways what it means to have a German and an African heritage beause there are many interracial families. Or a German and Asian or Middle Eastern heritage, since it is an international school. Some of the children have a Swiss heritage and some have ties to the Netherlands. Their parents are also from different parts of Ghana. 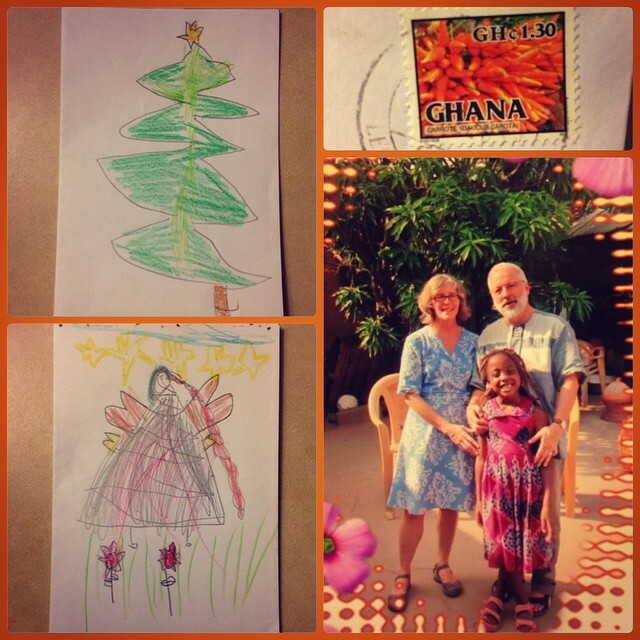 Hannah has thrived at the school, with guidance from Ghanaian, English and German teachers. Hannah’s African American and German heritages came together this year on Lantern Day, November 11. On this day, Germans celebrate St. Martin of Tours, who was the son of Roman Military Tribune in Savaria, in what is now Hungary. Modesty and altruism are the virtues associated with this saint. The children at Hannah’s school read a story in English and German about the saint meeting a poor man who was freezing and cutting his cloak in half to share it with the man. Martin is said to have left military service after this incident and devoted his life to serving the poor. The origin of the lanterns is not as clear, but like Christmas lights, they light the darkness as the northern nations like Germany have longer and longer dark nights in November and December. At the German Swiss School the children sang traditional lantern songs like “Laterne, Laterne, Sonne, Mond und Sterne” (lantern, lantern, sun, moon, and stars). They also sang “This Little Light of Mine,” the traditional African American song. As the entire German Swiss International School school and parents walked in the night singing “This Little Light of Mine,” I felt tears of joy as my daughter’s heritages came together on a magical Ghana night. Lovely account of a very interesting year!